South Main Street between Lancaster Ave. and Vickery Blvd. recently received new pavement markings. 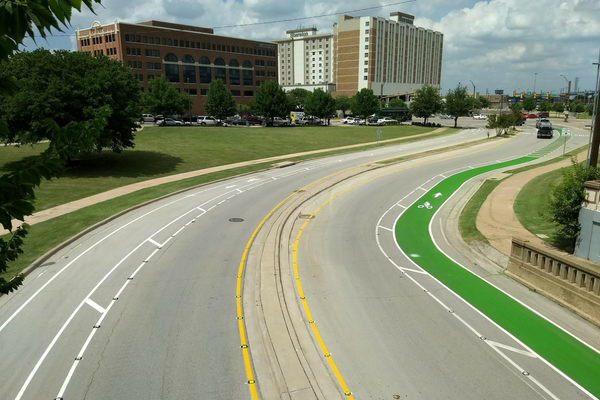 While the configuration remains the same, the City of Fort Worth included the addition of green bike lane markings on the northbound approach to Lancaster. The pavement markings were well worn off, and due to the unique configuration of the curve, there was confusion about the proper distribution of traffic movements. The green bike lane helps indicate to drivers their proper lane designation, and alerts them to the conflict area where the bike lane crosses the right-turn lane. Fun fact: The green bike lane material is made up of recycled and colorized computer monitor screens! The City of Fort Worth will be evaluating their effectiveness and durability over the next several years.